What is an Inspection Certificate or Certificate of Inspection? Required usually for import of consumer goods such as softlines, hardlines, electronic goods, luxury goods; commodities such as bulk oil shipments and bulk scraps shipments, inspection certificate is one of the most important trade documents. Inspection certificate, sometimes called as certificate of inspection or pre-shipment inspection certificate, is a trade document used in international trade transactions, issued generally by an independent inspection company after conducting a related inspection, certifying whether or not the goods are in question are in conformity with the specifications stated on the sales contract. 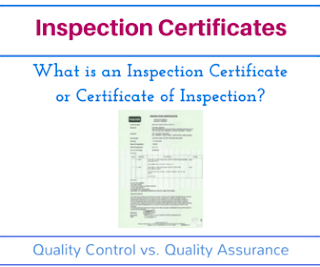 On this page I would like to explain inspection certificate in detail. What is the function of an inspection certificate in export and import businesses? 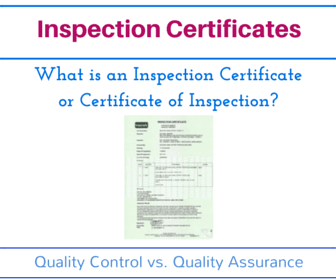 What are the types of inspection certificates? Are all inspection certificates are the same? Who should issue and sign the inspection certificate? When should the inspection certificate be issued? What are the benefits of an inspection certificate? What is the function of an inspection certificate in an export-import business? An inspection certificate, which is issued by an independent trustable company, verifies whether or not the goods are in conformity with the sales contract in regards to quality, quantity, tariff classification, import eligibility and price of the goods for customs purposes. In some instances buyers could not trust the sellers' production quality or else conditions may dictate that the quality of the goods must be approved before they will be dispatched from the exporter's factory. In such a circumstance, an independent company, which is trustable by both buyer and seller, must be checking the goods and verifies its findings with a certificate specifying whether or not the goods are in conformity with the sales contract. This example illustrates the function of a commercial inspection and commercial inspection certificate. In addition to commercial inspection certificates, it is possible to talk about some form of official inspection certificates, which are requested by the custom offices of some importing countries during the import procedures. For example all goods that will be exported to Iraq should accompany a pre-shipment inspection certificate, which confirms the quality, quantity, tariff classification, import eligibility and price of the goods for customs purposes. Which countries demand official pre-shipment inspection certificates? Angola, Bangladesh, Benin, Burkina Faso, Burundi, Cambodia, Cameroon, Central African Republic, Comoros, Republic of Congo (Brazzaville), Democratic Republic of Congo (Kinshasa), Cote d’Ivoire, Ecuador, Ethiopia, Guinea, India , Indonesia, Iran, Kenya , Kuwait, Liberia, Madagascar, Malawi, Mali, Mauritania, Mexico, Mozambique, Niger, Senegal, Sierra Leone, Togo, Uzbekistan. You should take into account that there are couple of different types of independent inspections are available on the market such as Pre-Shipment Inspection, Container Loading Supervision, During Production Inspection, Pre-Production Inspection, Post-Shipment Inspection etc. Because each inspection is carried out for a different purpose, the report which contains the findings of the inspection will wary along with the inspection that was chosen. Inspection certificate, which is created after the completion of the related inspection, should be issued by the inspector, who works for an independent inspection company. In most cases inspection certificates are issued just after the completion of the inspection and signed by the inspectors, who conducted the inspection. Many inspection companies publish full inspection reports online as a result buyers can reach inspection results simultaneously. As a rule of thumb, inspection certificate should be issued on a formal company letterhead of the inspection company. Global Inspection Companies: Third party inspections in international trade, either commercial or official, are generally carried out by multinational big independent inspection companies, whose management belongs to western countries such as USA, Germany, Switzerland, Netherlands etc. SGS, Bureau Veritas SA, Intertek, Cotecna, Alfred H Knight International Ltd, Baltic Control Ltd. Aarhus, CIS Commodity Inspection Services, Control Union International, CSA Group, are some of the biggest inspection companies operate in global scale. Inspection certificates are issued just after the completion of the independent inspection. As I have mentioned above almost every inspection company publishes an online inspection certificate in addition to paper based test reports. What are the benefits of an inspection certificate for exporters and importers? Inspection certificate clears doubts about quality of the goods and assists in achieving desired level of quality. Inspection certificate evidences the quality of the goods by a 3rd party. In case importer receives poor quality goods despite a positive inspection certificate, it is possible to claim compensation from the inspection company. Inspection certificate may function as a documentary evidence under letter of credit transactions.